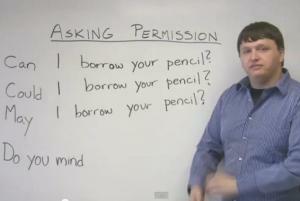 This lesson teaches how to use "can" to ask permission. Can I come in? 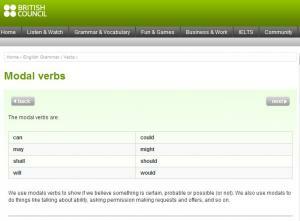 There are also three activities to practice the helping verbs, do, does and can. In each activity there is a dialogue to complete. There is a lot of practice in this excellent lesson. 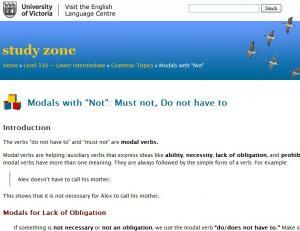 This page explains how to use modal verbs "must not" and "do not have to". Includes an exercise. 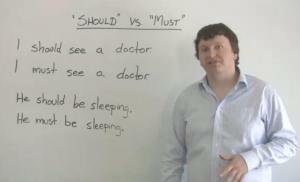 If you want to understand the difference in meaning between “should” and “must,” you should check out this free grammar lesson! After you have watched the class, you should take the free quiz below to test your understanding. Watch the video of Sophie discovering some unusual Indonesian food then complete the exercises to see how the modal verbs might, may and could + an infinitive form without 'to' can be used when we think it is possible something is true. 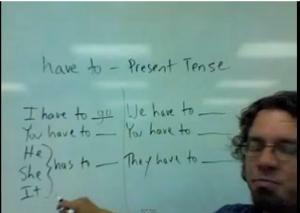 Learn about expressing activities you must do using the present tense of "have to" in this simple grammar video lesson. This video discusses the usage about "can", "could" and "be able to." 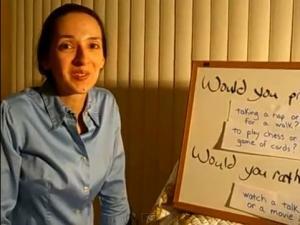 It includes an interactive quiz at the end of the video. 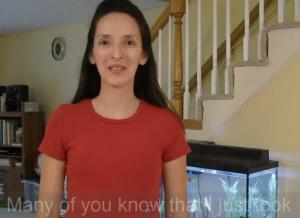 This video talks how to express preferences using PREFER, WOULD PREFER, and WOULD RATHER. 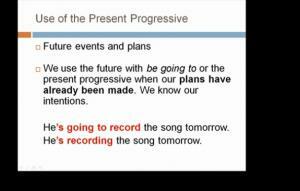 Learn how to use modal verbs to form the future tense in this video. Make sure to move on to Part 2 of this lesson when you're done! We use the modal verbs can, could and would to offer to do things for people or to invite them to do something. We also use them to make requests or ask permission to do something. 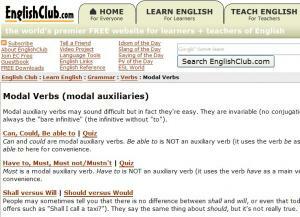 This a great resource to learn and understand modal verbs and practice using them. 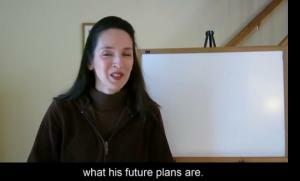 Learn how to use modal verbs to create the future tenses as you watch this video. Be sure to watch Part 1 of this lesson! This list of 8 modal verbs links to a list of each of their uses, with examples. Click the links and you can see the details. 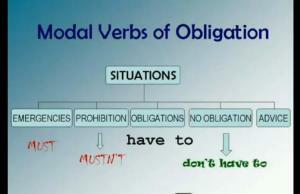 Could, should, be able to, have to, must; these are all examples of modal verbs. 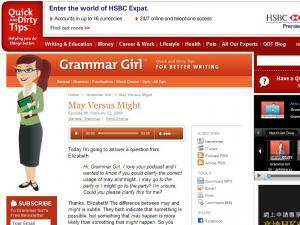 If you need more practice with modal verbs, this link has quizzes and lessons. 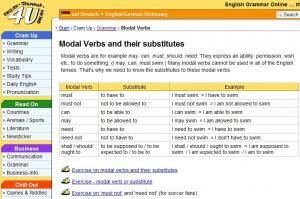 This page lists several common modal verbs - like must, can, may and need - along with their possible substitutes. There are a few exercises for you to practice your knowledge of these modals. The exercises will tell you if you got the answers right or wrong. How do you express actions that you must or must not do? 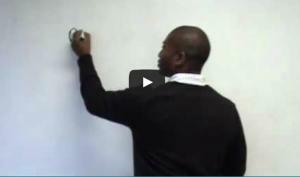 There are several ways and this video lesson covers the use of modal verbs of obligation like 'must', 'have to' and 'should' with lots of interactive oral exercises at the end of the video. Ask Permission Politely with "Can" and "May"
Politeness, formality, and necessity are all important parts of asking permission. 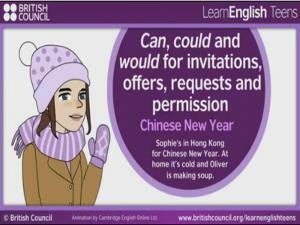 This video lesson explains how CAN, COULD, MAY, and DO YOU MIND can all be used to ask permission in English, with different effects. In this beginner English lesson you will learn how to use "can" and "could" to ask and answer simple questions about what is possible. 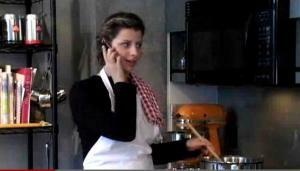 You will see people discussing meals and menus on the phone using these verbs. Where is your best friend right now? Why is the bus late? 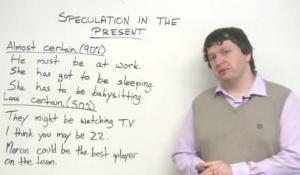 Learn to talk about possibility and speculation in the present! 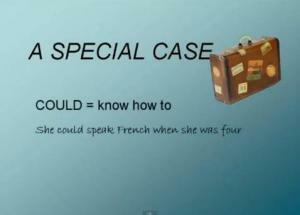 Here, you will learn how to use “must,” “have to,” “might,” “may,” and “could” for speculation. 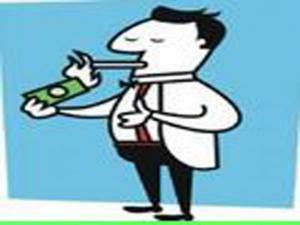 You will want to check out this lesson if you are interested in improving your English. 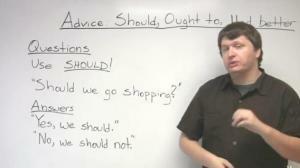 How to Give Advice in English with "Should," "Ought to" and "Had Better"
In this English lesson, the teacher teaches you how to give advice, using 'should', 'ought to', and 'had better'. These are used differently and can mean different things. Learn about those differences here! A list of modals and their contracted forms. Also includes notes on usage. In English, modals are used to express possibility, permission, and also advice. In this lesson you will learn which modals show advisability and how to use them! 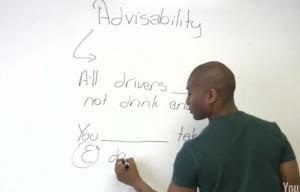 This video describes how to use modal verbs to express possibilities in the past. Although the "may" and "might" is similar, there are some subtle differences. Listen the audio with transcript and you can find the answer. 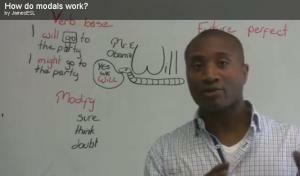 This English grammar class shows how the future tense of ‘will’ can teach you everything you need in order to understand modals. If you know the future tense very well, this technique will help you understand modal verbs like can, could and might. 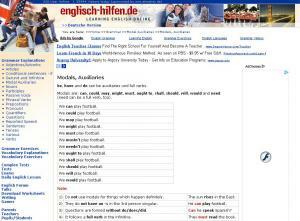 The word 'should' doesn't follow the normal rules in English, when used in the past tense. 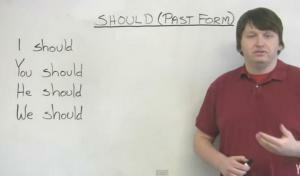 In this grammar lesson, it explains how to use 'should' in the past tense to form sentences like "I should have watched the lesson!" 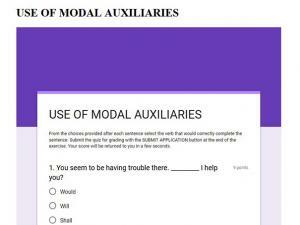 Excellent resource for learning and practicing the use of modal verbs in the past, present and future to express certainty, advice, permission and more. 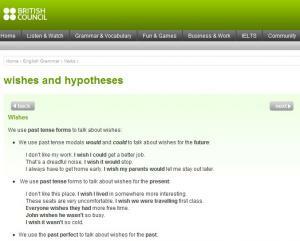 Learn about how to use the past tense and modals to talk about hypotheses (things we might imagine) and wishes. There's a self-checking quiz for you to practice how much you learned!